Sara Eldridge, LMSW, Assistant Director of Social Services at Barrier Free Living’s Freedom House domestic violence shelter is a licensed social worker who received a Master’s Degree in Social Work from Silberman School of Social Work at Hunter College in 2015. Sara has been a social worker at Freedom House since 2015, where she provides individual and group counseling to adults, children and adolescents. Prior to Freedom House she worked with youth in alternatives to detention and incarceration programs, student veterans and crime victims. 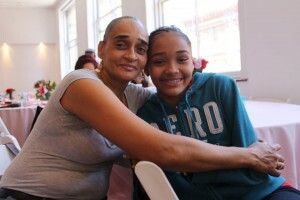 Photo at top, a mother and daughter who are residents at BFL Apartments, at a Mom Day Event held by Spread the Sparkle. As a shelter working with survivors of domestic violence and their children, Freedom House takes a team approach to guiding families back to healing. Our clinical team realizes that mothers and fathers who leave an abusive relationship often struggle to re-establish a positive family dynamic. We have a number of practices in place that can support this process. One of the tactics abusers use is undermining the victim’s parenting skills, such as telling him/her he/she’s a bad mother/father, encouraging the children not to listen when she/he tries to discipline them, rewarding the children for misbehavior, and threatening to call child protective services. When the victim has a disability, an abuser may use this as evidence that she/he is an unfit parent who can’t care for the children. Abusers may try to make the victim feel guilty for working and not spending enough time with their child, or conversely may resent the attention a mother or father gives to a child instead of the abuser. If the child has a disability, the abuser may tell the mother/father it’s her/his fault the child is disabled, refuse to help care for the child, or try to force her/him to have the child placed in a residential setting. All of these tactics can make it difficult for mothers/fathers to feel confident in their parenting abilities. Another key factor in the relationship between abuse survivors and their children is the emotional impact of the trauma they’ve experienced. Many survivors of domestic violence experience post-traumatic stress disorder, depression, anxiety, and other mental health symptoms. As a result, it can be difficult to bond with and adequately parent their children because they are struggling to manage their emotional distress, which may be compounded by the distress their children are experiencing. When parents arrive at Freedom House, they meet with the Coordinator of Family Services within the first two weeks to discuss concerns related to their children. Beginning in June, 2018 Freedom House will be partnering with the Northern Manhattan Family Resource Center to offer bi-monthly on-site parenting workshops on topics like child development, healthy discipline techniques and effective communication. These confidential workshops will be facilitated by a parent advocate who has experience raising a child with behavioral or emotional difficulties. The advocate can also provide individual support to parents who need assistance accessing services for their children or further developing their parenting skills. Our occupational therapy (OT) team regularly offers “Mommy/Daddy and Me” classes for parents and children to take together. This can help build a stronger bond, as well as providing a support system for parents, increase children’s motor development, muscle strength, independence and social awareness for the child. OT also offers individual sessions for survivors to work on parenting skills through one-on-one coaching. Freedom Houses’ on-site childcare offers respite on Fridays so parents can take a few hours to do chores, take a nap, or simply relax and recharge away from their children. One mother came to Freedom House with several young children. She informed her social worker that her abuser had often criticized her parenting, including blaming her for her son’s autism, and had told her children not to listen to her. She felt depressed and fearful as a result of years of abuse. She spent most of her time with her children struggling to discipline them and very little time engaging in fun activities. Her social worker connected her with preventive services to begin receiving child parent psychotherapy and connected her with resources for parents of autistic children. She frequently attended occupational therapy sessions with her younger children, which provided another opportunity to work on her parenting skills as well as have fun with her children. In weekly counseling sessions with her social worker she gradually became more confident in her parenting and her mood improved. By the time she left Freedom House for her own apartment, she proudly reported that she was taking the children for weekly picnics, she was arguing with the children less, and she was optimistic about the future. **On Thursday, May 10th, Freedom House domestic violence shelter will be hosting a Mother’s Day event with activities for both mothers and their children, dinner, and entertainment. Freedom House believes that Mother’s Day should be a joyful time for mothers and children to celebrate together. Hi Sara, I’m so sorry to hear of the recent closing of one of your programs that provided safe affordable housing. Thanks. We sent your comment to Sara.